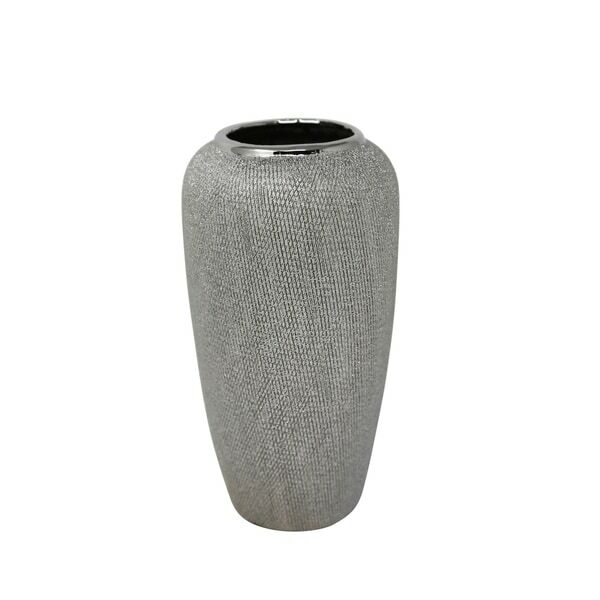 This tapered ceramic vase would be a perfect decorative piece for your living space. Made out of high quality ceramic it would be long lasting. The glossy silver colour adds bling to this piece. The textured pattern adds a grainy look to the vase. The pattern can be felt with your hand. The mouth of the vase is rimmed and smoothened. The vase would be able to hold a number of items. You can keep fresh bouquet of flowers in the vase or keep the vase as a decorative piece on your table. The textured pattern adds a grainy look to the vase. Dimensions 6.25 In. X 6.25 In. X 12.25 In.